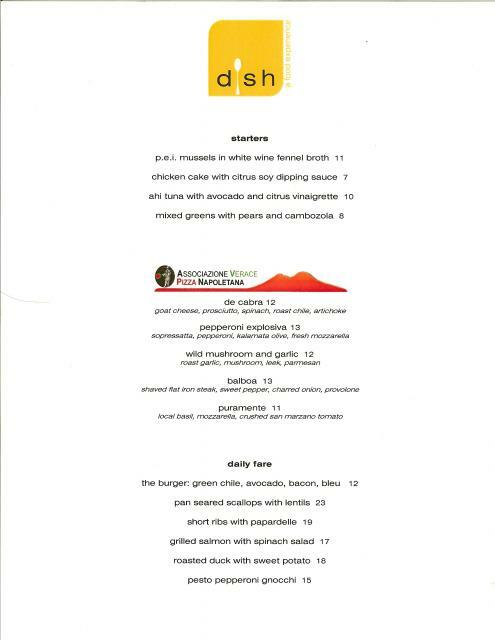 There has been a SIGNIFICANT development in the Phoenix dining landscape, the 800 pound gorilla has arrived (IMO) and it is called Dish, a food experience. I did not think about what 12,000 sq. ft. was going to look like before I walked in but the effect was sort of like whiplash. Dish aims to deliver at a level that would place it far above anything that is currently operating in this genre in Phoenix, will it succeed...time will tell, but if first impressions count for anything then I was wowed! Upon walking thru the front door, a large display case that curves around the middle of the front room has a dizzying array of prepared foods (salads of all kinds, entrees, sides) on the opposite side of the circular display case is sushi and some pastry, on the right perimeter is the baked bread station then cheeses (great selection), chocolates ( if it was not so hot out, I would have nabbed a chocolate pretzel bar ), made to order salads and sandwich station, past that is another station that serves BBQ ribs, brisket , turkey, broasted chicken, a couple of naan sandwiches and a fish of the day selection, then a gelato station with coffees and morning pastries, the end of this circuit is a beverage case with a large array of sodas, waters etc and then the cashiers. Throughout the front room are gourmet packaged goods in the Dean and Deluca kind of way. The bistro is in the second room and that is open during the evening at this point (Dish Bistro Menu). I had a BBQ Brisket Naan (tasty), broasted chicken (tasty with a nice spice to it), a couple of side salads (just ok), cupcake (decent, not enough frosting, but a relief from the spots that slather it on) and a brown butter tart (decent). Many of the foods will be tweaked along the way as the recipes for most of the front room offerings come from their consulting group (eatZi's). With this much selection, I would think that it will take some time to weed thru what works and what needs some help. Food that is ordered to be eaten there can be enjoyed in an area in the front room or during the day the bistro is open to bring food from the front room into and sit down at a table. This is week one of operating a monster venture and I think they are doing a great job (lots of staff, eager to help and give samples). I will definitely be going back and my shadow will now cross the former leader in this space a lot less. I think the ripples felt from Dish's opening will be felt at many local spots and this is something Phoenix deserves. The Executive Chef of the Bistro has left and he had a great resume so I wonder how that will effect the restaurant? He did not leave because of another gig, the departure had to do with the culinary direction of the concept.